The tenor breaks into song next to bunches of bananas strung high above ripe papaya. Wearing a red market apron, he approaches a woman wrapped in a purple shawl and serenades her for 90 seconds while clutching her hand and looking her in the eyes. Tears stream down the woman’s face. After the song, the tenor hugs the women — a total stranger before the serenade — and kisses her on the cheek. Shopper Ana Garcia, 65, says she never expected to hear “such beautiful voices” while browsing the fruit aisle. The tenor is a market vendor himself: Francisco Pedraza sells shoes seven days a week near the Basilica of Guadalupe. He trained to sing opera via private lessons from the age of 16 until 30, but he felt excluded from the tightknit opera circle in Mexico. He performed when and where he could, often as a backup singer for bands that play regional Mexican music. “The voice is an instrument that you have to exercise continuously to always maintain the same range,” he says. One day in June, the opera crew appeared for a sound check at the market where Pedraza sells shoes. Pedraza, who is 50, approached the group’s artistic director. He auditioned on the spot and was invited to join the troupe. Pedraza’s wife runs the store while he’s out singing. The singers are on tour as part of a pilot program that began in June and concludes in November. Juan Carlos Diaz, coordinator of the community cultural action program for Mexico’s national fine arts institute, says he is planning more impromptu operas in 2019. The idea is to awaken interest in the arts by bringing opera and dance performances to places where people gather, such as public markets and metro stations. Diaz calls them “spontaneous interruptions in social life.” The fine arts institute is also coaching kids to make puppets and other crafts at city museums. Bringing song to the marketplaces, between tomatoes and avocados, injects a primal element to the performance, Rendon says, since everybody eats. The concept also taps into deep cultural roots for Mexicans. Indoor markets are an adaptation of the open-air selling that has taken place in Mexico City since the days of the Aztecs. “This is where our humanity connects — the food, the smells, the flavors — and it’s even better with music,” Rendon says shortly before launching into a sultry rendition of “Habanera” from the opera “Carmen,” green apple in one hand, plastic shopping bag in the other, capped with a giant kiss on the cheek of a woman who hawks chicken feet from a cart. Interaction with the crowd is key to the performances. It’s a way for onlookers to feel like they are part of the spectacle and show that fine art is within their reach — to dispel notions that opera is only for elites. The show wraps with the cheerful so-called drinking song from “La Traviata.” A vendor thanks the singers with free cups of papaya juice, while another who says he got goose bumps from the performance invites them to a round of carnitas tacos. Jesus Montes, a fourth-generation fishmonger, lingered afterward with a spellbound expression on his face. The 18-year-old says he relished the break in routine and the introduction to another form of music, saying he listens to “classic” Latin genres such as reggaeton, a cousin of rap, and banda, which is heavy on brass instruments for a polka-like sound. Montes found the opera performance relaxing. “Trying new things can be really beautiful, and sometimes it changes the way you think, which is what happened today,” he says. Montes says seeing singers in aprons, intermingled with vendors, gave him a greater sense of camaraderie with them. 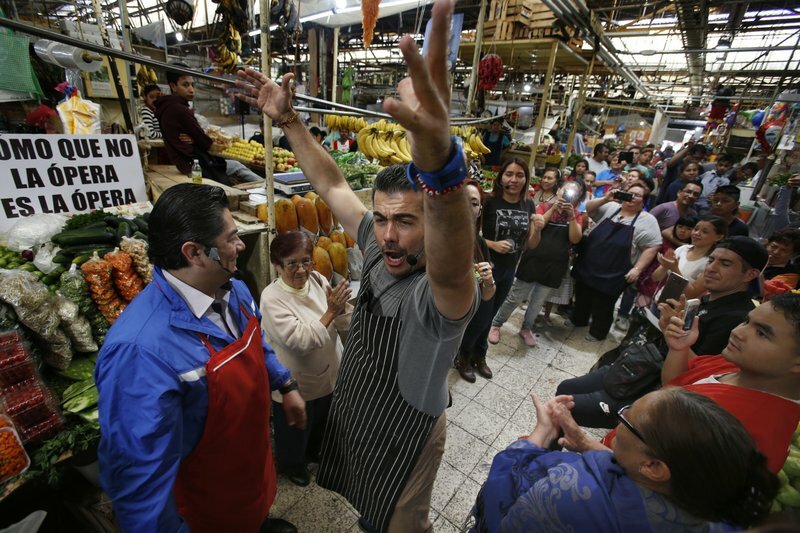 Upon hearing that tenor Pedraza is a real-life market vendor, Montes lights up, saying that gives him hope that he can achieve more personal development himself. “Not just anybody has a voice that powerful,” he says.